Holly is one of the best and brightest detectives on the Massachusetts State Police Force. She is an expert in her ability to assemble clues while tracking missing persons or hunting down criminals. How did she get to be so good at her job? That’s easy — she works like a dog. As we learn in NATURE’s Underdogs, Holly is a bloodhound once slated for the death chamber. In her youth, she was so destructive that no family could manage her as a pet. Passed from home to home six times before her first birthday, she had little prospect of making it to adolescence. But then, someone entered her life who sensed that behind Holly’s troubled eyes was an animal with phenomenal natural abilities. For the past 25 years, Larry Allen, a member of Barbour County Tactical Search and Recovery Teams in West Virginia, has been training bloodhounds for law enforcement agencies across the country. Rescuing problem dogs like Holly, he works them through their behavioral issues so that they may achieve their full potential as “gainfully employed” trackers. But Allen insists that training is a relatively small part of what makes these dogs so good at what they do. “The working ability of a bloodhound is 75 percent nature and 25 percent nurture,” he says. And the nature part of the equation resides in the animal’s exquisitely designed nose. Holly now serves as an olfactory sleuth with the K-9 corps of the Massachusetts State Police. Often called a nose with a dog attached, the bloodhound is so adept at scent tracking its trailing results is admissible evidence in a court of law. Its outstanding ability to read terrain with its nose is primarily due to a large, ultrasensitive set of scent membranes that allows the dog to distinguish smells at least a thousand times better than humans. When a bloodhound sniffs a scent article (a piece of clothing or item touched only by the subject), air rushes through its nasal cavity and chemical vapors — or odors — lodge in the mucus and bombard the dog’s scent receptors. Chemical signals are then sent to the olfactory bulb, the part of the brain that analyzes smells, and an “odor image” is created. For the dog, this image is far more detailed than a photograph is for a human. Using the odor image as a reference, the bloodhound is able to locate a subject’s trail, which is made up of a chemical cocktail of scents including breath, sweat vapor, and skin rafts. Once the bloodhound identifies the trail, it will not divert its attention despite being assailed by a multitude of other odors. Only when the dog finds the source of the scent or reaches the end of the trail will it relent. 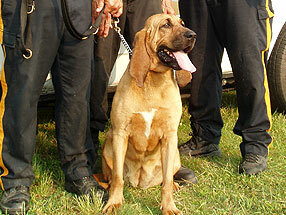 So potent is the drive to track, bloodhounds have been known to stick to a trail for more than 130 miles. 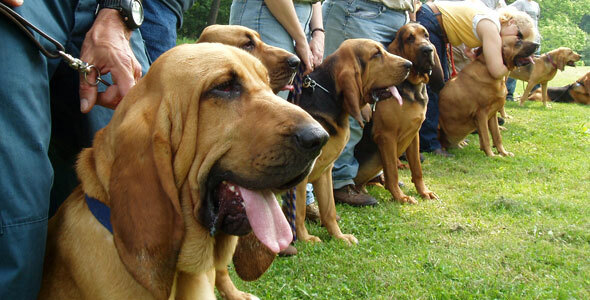 A bloodhound’s outward appearance also adds to its tracking ability. Loose, wrinkled skin around the face helps trap scent particles and long, drooping ears that drag on the ground collect odors and sweep them into the nostril area. The dog’s long neck and muscular shoulders, which slope into its strong back, allow it to track close to the ground for miles on end. For the past two centuries, these natural-born detectives have proven legendary in their role in law enforcement. One of the greatest sleuths in canine history was a Kentucky bloodhound called Nick Carter. His dogged persistence led to the capture and conviction of more than 600 criminals throughout his illustrious career. Despite the technological advances of our current age, many experts agree that these canines are a greater asset to a police force than some of the best high-tech surveillance equipment. Their extraordinary ability to discern a cold trail has sent them on fruitful missions, following tracks over 300 hours old. As for Holly, she has been given a second chance and a fresh new start in life. What could be more rewarding than that?